It seems that I just cannot let one project go without having a "go" at it. Originally, when the Altaria N-1 Model Rocket kit began to look like a "challenge from Hell," I decided to download the page files for the Currell Graphics paper N-1 model to be used either as a back-up plan for the entire bird, or at least as graphic "feed stock" for replacement parts to be made from. Well, we persevered through the Altaria build and got a lot better results than expected. That left the now-printed pages of the 1/96 Currell N-1 model stacked up on the back workbench. Because the sheets were beyond the capacity of our HP 8100 OfficeJet printer (19" by 11"), I had to have them done by a local printing house, on glossy heavy card stock paper. Now that the Altaria model was completed, the Currell model was still sitting there...waiting. I couldn't just leave it there. So, we got out the instruction pages and our tools of the trade and set about cutting, trimming, gluing and assembling the paper N-1. In some ways, it's a better model than the Altaria. 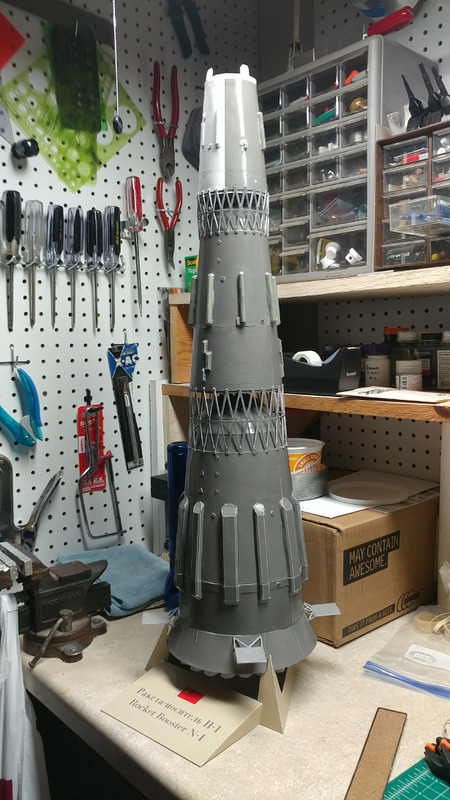 The surfaces are pre-colored and nicely detailed, the parts are logically labeled, numbered and cited in the manual correctly and the structure of the model has good basic stability. However, it does lack in the richness of surface detail "relief" that the parts applied to the skins of the Altaria provides. 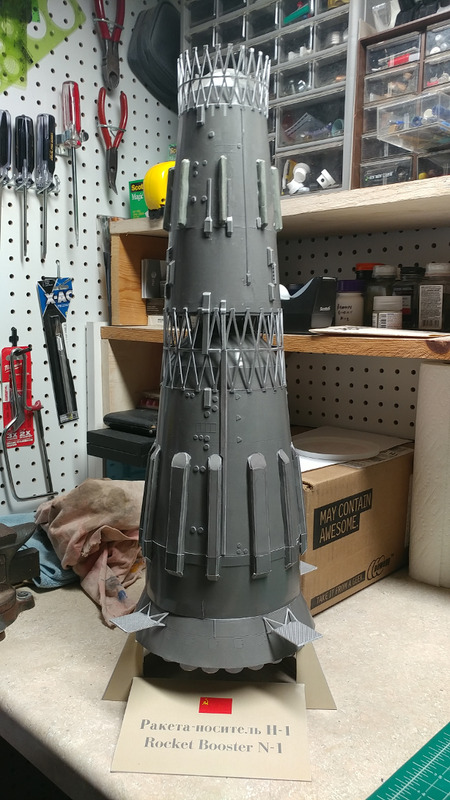 Be that as it may, this N-1 was free (except for the $30 spent to print it) and it will be in the same scale as out Revell Apollo/Saturn V, indicating the similarities and differences between each country's approach to the Moon Shot. I did not document the build in detail, as the process is very straight-forward and I was not going to publish a "build article" on it in the first place. So we pick up at the point where the entire first stage has been completed and married to the Second Stage, using the Inter-stage Truss. We see the entire first & second stages completed, with the Second/Third Stage Truss already in place. The markings of the Currell model are the same as those of the Altaria model as I built it - the markings of the first N-1 flight, N1-3L. So, the Third Stage is one-half gray and one-half white. The tabs at the top of the Third Stage will engage into slots on the lower body ring of the LOK/LK Shroud, which covers both the orbiting and landing craft, as well as the fourth stage, which is used for lunar orbit insertion and powered decent initiation of the LK towards the lunar surface. The completed Currell Graphics N-1, resting on the Starfleet Command table outside the workshop. This was her temporary display site, until proper fixtures could be readied for use in the Apollo Room. 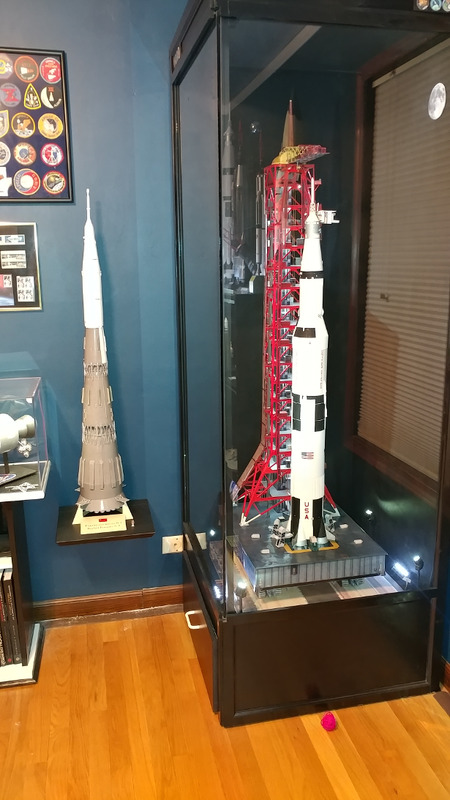 The black shelf we made is placed 19" above the floor - approximately the same height as the base of the Saturn V is off the floor, in order to show the relative height comparison. While this paper model is no "cake-walk," it is also no where near as complex a model to build as the Altaria was and yields excellent results. 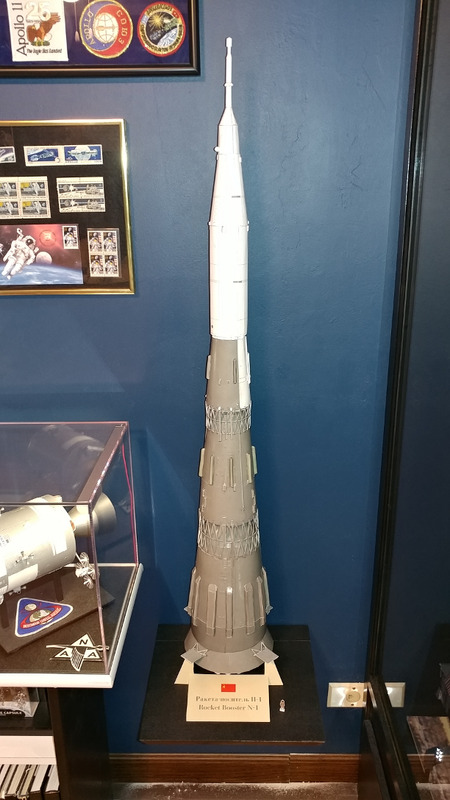 For anyone who wants a good quality, basic model of the long-secret Soviet Moon Rocket, the Currell N-1 model is the way to go. 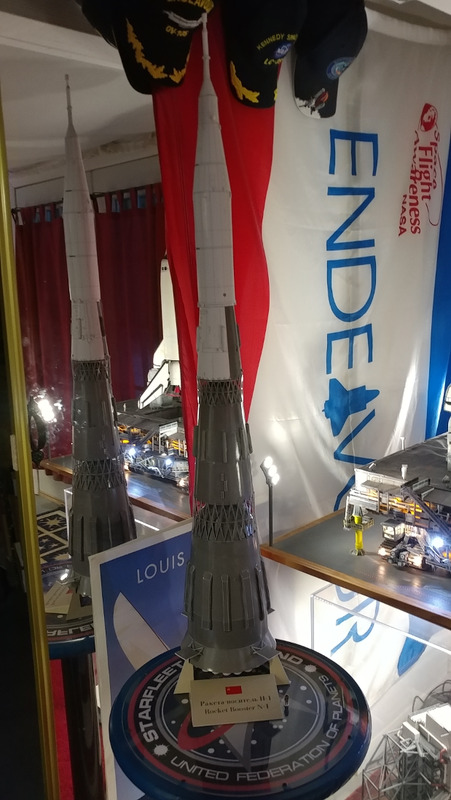 Also, if your own Saturn V "reference model" happens to be a Monogram or Airfix kit in 1/144 scale, the Currell N-1 is also download-able as a 1/144 scale version as well. Just follow the link - https://currell.net/models/mod_free.htm - and click on the picture of the N-1.